If you hope to burn excess fat so you can lose weight, you can ask your doctor for a prescription appetite suppressant or fat blocking drug, notes the National Institute of Diabetes and Digestive and Kidney Diseases. None of the Food and Drug Administration-approved diet pills contain caffeine. But almost all over-the-counter fat burners and weight loss supplements are ineffective, and some are even potentially dangerous especially when combined with caffeine, so use caution before taking any diet pill and discussing it with your doctor. Orlistat can help you lose weight because the drug blocks the fat from your food from being digested in your body, according to PubMed Health. The drug is available as prescription Xenical or over-the-counter Alli. But in 2009, the Food and Drug Administration began investigating claims that orlistat may, in rare cases, cause serious liver injuries. Also, if you eat meals with more than 15 g of fat you risk experiencing problems such as uncontrollable bowel movements, loose or fatty stools and gas that leaks oil onto your clothing. Phentermine is a caffeine-free appetite suppressant that doctors have prescribed to dieters since 1959, notes the Mayo Clinic. The amphetamine-like drug decreases your appetite and increases your energy, but you should not use it for more than 12 weeks at a time. If you have high blood pressure or a history of substance abuse, you should not take phentermine. You may experience side effects such as blurred vision, sleeplessness or constipation after taking the medication. Diethylpropion and phendimetrazine are caffeine-free prescription appetite suppressants that can also help you shed excess fat, according to the National Institute of Diabetes and Digestive and Kidney Diseases. But if you are pregnant or nursing, you should not take such medications. Many doctors will only prescribe these drugs for a few weeks at a time because they are potentially habit-forming. You may suffer side effects such as dizziness, headache, sleeping problems or nervousness after taking appetite suppressants. Ephedra, when combined with caffeine, caused approximately 100 deaths and led to the Food and Drug Administration to ban ephedra sales in 2004, according to ConsumersUnion.org. Combining caffeine with even natural substances is a dangerous practice. If you decide to consume an over-the-counter supplement and want to avoid ingesting caffeine, check the label to ensure that the ingredients do not include common synonyms for caffeine such as guarana, kola nut, maté, paullinia cupana, and tea extract. 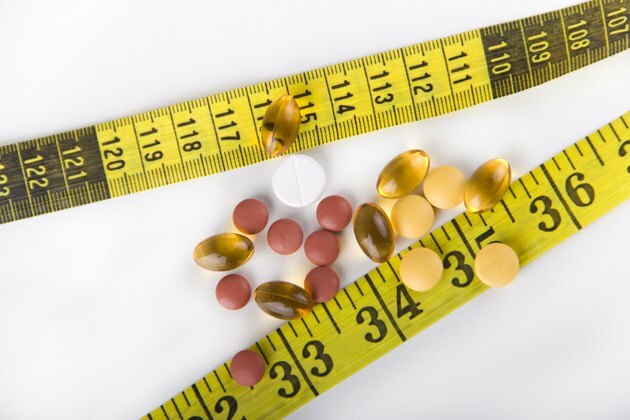 Which Diet Pills Work Best for Energy and Weight Loss? What Are the Side Effects of Grenade Fat Burner?